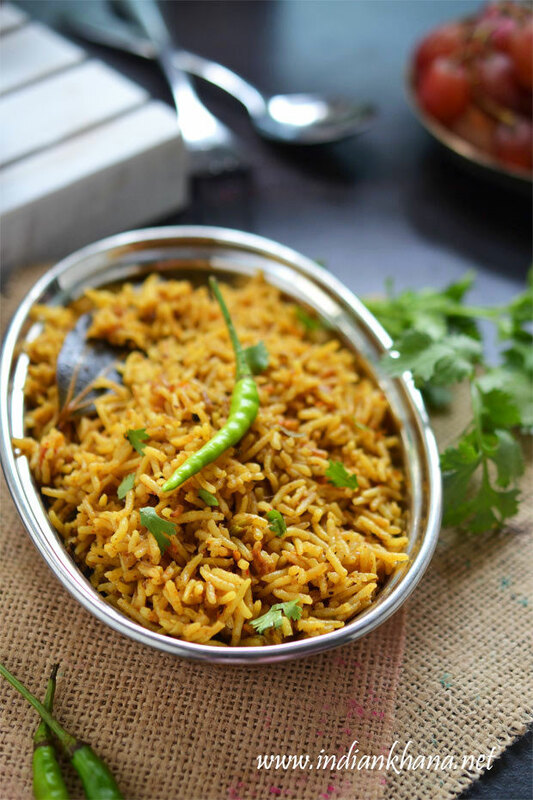 Madurai Kuska Biryani is very famous and this briyani recipe comes very handy if we don't have vegetables at home or want to make something special yet simple, also makes good for lunch box. 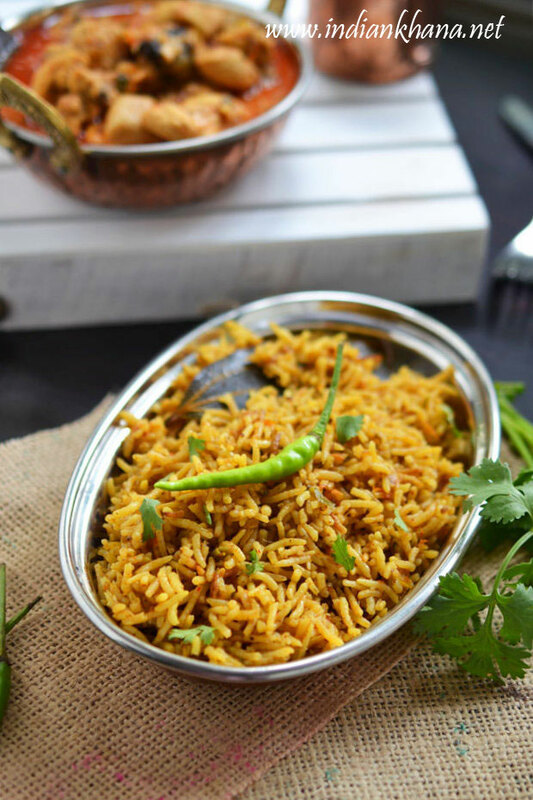 I specially like this when making a large menu for guest where we have 2 to 3 vegetables, non-veg curry if making, dal then this plain biriyani makes it special and yet simple to get pair along any side dish perfectly. Khushka biryani also comes with chicken but that we not going to focus on today, this simple biryani is very flavorful we just serve this even with simple raita and it makes a wonderful meal, I made this on Bakrid day and though I made it extra for dinner too but it got over in lunch time itself, everyone like it very much and asking for me, good sign isn't it? 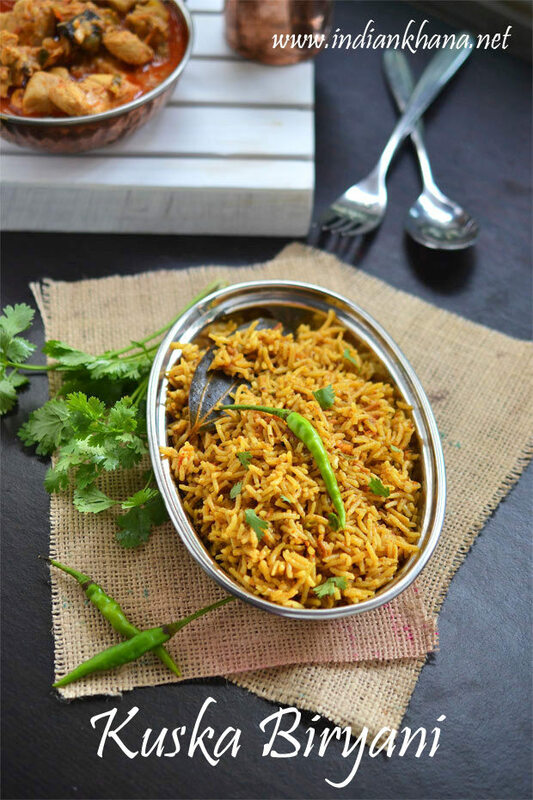 If you have diwali party, dinner, get-together or pot-luck then makes kuska biryani makes wonderful choice as it's veg, you can pair this with any side dish and it's easy to make, take very less time what else to ask for isn't it? You can check the diwali full dinner, lunch menu here and do let me know if you try this. You can also check other Rice Recipes here. 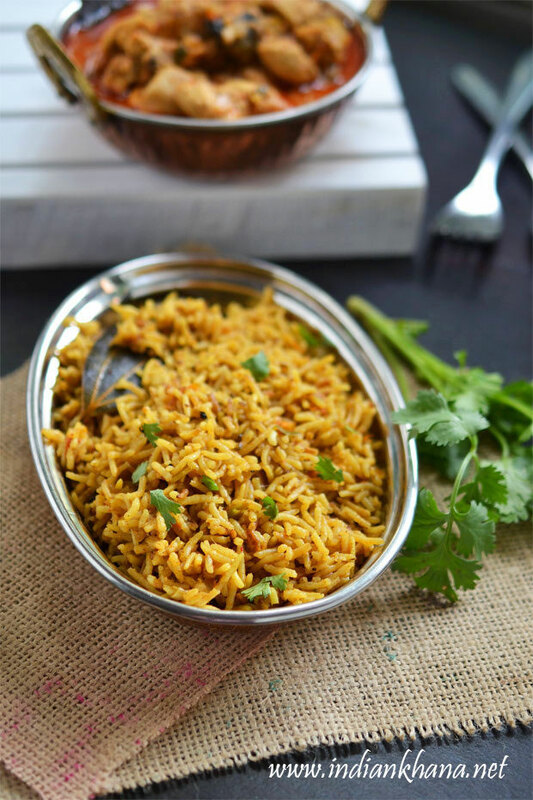 Flavourful one pot biryani made without meat or vegetables. Wash and soak rice until we needed it or for 15 to 20 mins. Peel and finely chop onion, tomato, green chilies. Grind mint leaves (pudina), coriander leaves, green chili and keep aside. Dry roast all the ingredients except nutmeg listed under 'To Roast and Grind' for a minute or until aromatic, allow to cool and grind with nutmeg into powder. I used my mortar-pestle to pound. Heat oil in pressure cooker (you can ghee or oil+ghee, I used only oil here) add all the ingredients listed under 'For Tempering' and allow cumin seeds to splutter. Add onion, green chilies and saute until onion becomes soft, add ginger-garlic paste, turmeric powder, red chili powder, garam masala (if using), fresh spice mix (that we just made) mix well and cook for a min in sow flame. Now add tomato, mint-coriander paste, mix well and cook in slow flame until tomato gets mashed. Once tomato gets mashed add 2 tbsp of water mix again and let it cook for 2 minutes in slow flame or until oil separated (water helps to cook the masala well), now add soaked, drained rice and mix gently, saute it for 2 mins with gentle stirring. 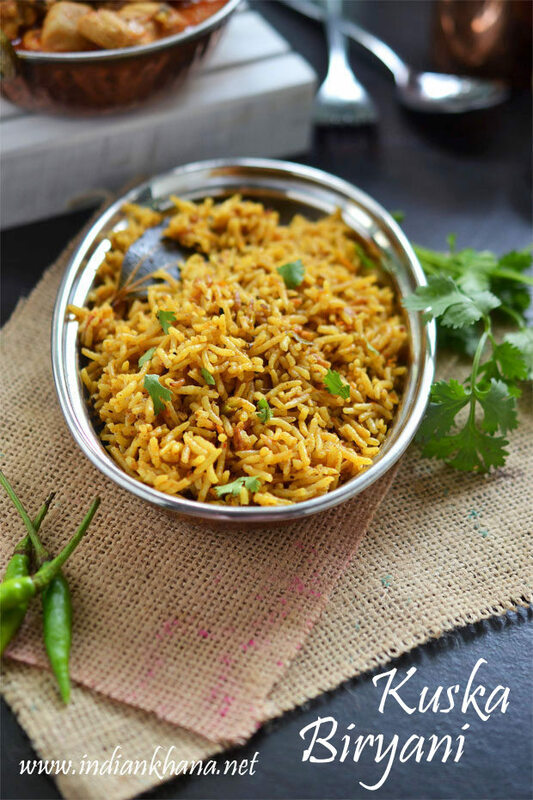 Add 3 1/4 cups or 3 1/2 cup water, salt to taste, coriander leaves mix and close cooker, cook for 1 whistle after that keep flame to slow and cook for 5 mins, off flame and allow to cool pressure cooker before you open, gently fork rice to mix everything. Serve hot or warm with kurma or any veg or non-veg side dish, raita. Ghee adds good flavor so you can use it, I don't add as DH doesn't eat ghee! Instead of basmatic you can use jeera or samba rice. You can do the same in a handi or open pan instead of pressure cooker. You can also replace water with coconut milk or use half water-half coconut milk. Use water quantity which gives you separated cooked rice, for 2 cups of basmatic rice I used 3 1/4 cups of water. 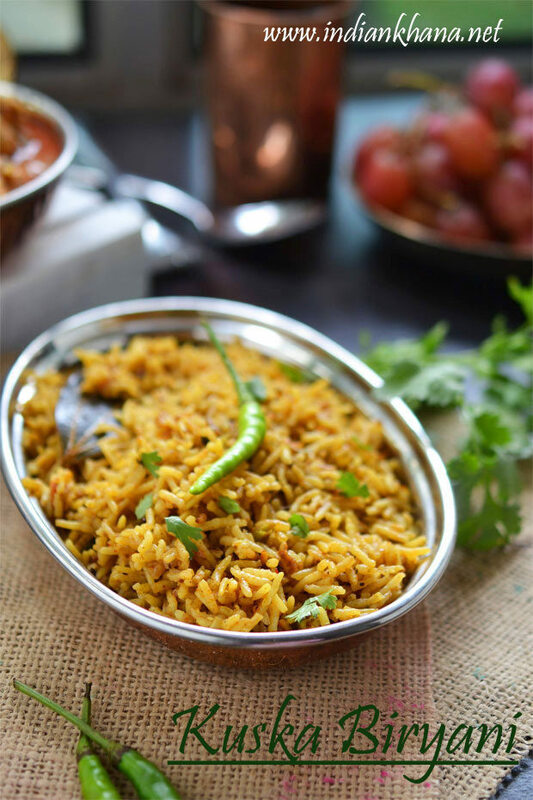 Delicious one-pot meal kuska biryani.